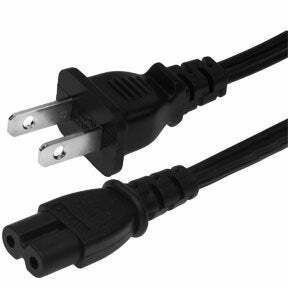 This heavy duty Power Cord is polarized for safety with a USA 2 pin plug end and a C7 figure 8 receptacle. It is made from 18 gauge wire for long lasting wear; 6 feet long; rated to 10A 125V and UL approved. USA 2 pin NEMA 1-15P to IEC C7 figure 8 receptacle. Category: American 2 Prong. 18/2 SPT-2 black wire. Rated up to 10A 125V. Length 6FT. NEMA 1-15P ultra low profile angle plug to down angle IEC C7 power cord: NEMA 1-15P USA low profile angled 2 prong plug to IEC C7 with 18/2 SPT-2 wire; 6 foot power cord with cUL approval. Our 2-Slot Polarized Right Angle Power Cords are perfect for replacing laptop or notebook cords. The right angle design prevents slot damage and its 18 AWG wire and fully molded fittings means it will last a long time. USA to C7 power cord: NEMA 1-15P standard USA 2 pin plug to IEC C7 figure 8 receptacle with 18/2 SPT-2 black wire power cord. Rated up to 10A 125V. 15 feet long. UL and CSA approvals. These IEC C7 power cords are commonly used in a variety of applications including electric shavers, portable electronics, notebook computers, CD and DVD players, kitchen appliances and game systems such as PlayStation II and Wii. They are Available in both polarized (one side flat) and non-polarized versions with the non-polarized being the far more popular power cord style and therefore is the one we stock for any country worldwide. We, at SFCable aim at fulfilling all your cable and other electronic accessory requirements at one single platform. We take special care of the quality of products on offer and provide lifetime technical support on all products. All our products are manufactured by ISO 9001 - 2000 registered manufacturers to maintain quality and safety.